On the morning of December 20th, one ambitious six grade classroom in Cottonwood Community School anxiously awaited the arrival of the Arizona Science Center’s “Science on Wheels” mobile unit; equipped with professional scientists, abundant lab coats, and… a bunch of squid. For eight weeks, 3rd-6th grade classrooms across the Cottonwood - Oak Creek School District participated in Science Happens Here, a scavenger hunt card game with a Grand Prize opportunity to conduct an experiment with professional scientists. To play, students and their families were asked to collect Science Happens Here trading cards from local businesses in the community. Each card explained a Scientific, Engineering, Technological, or Mathematical (STEM) process used within that independent business to showcase the breadth of science-related activities happening outside the classroom on a daily basis. The collectable cards then allowed students to unlock household experiments on the Science Happens Here website (www.sciencehappenshereaz.com), earning them a point for their classroom. Mrs. Heath’s students collectively earned a whopping 22 points, marking them this season’s victors of Science Happens Here! 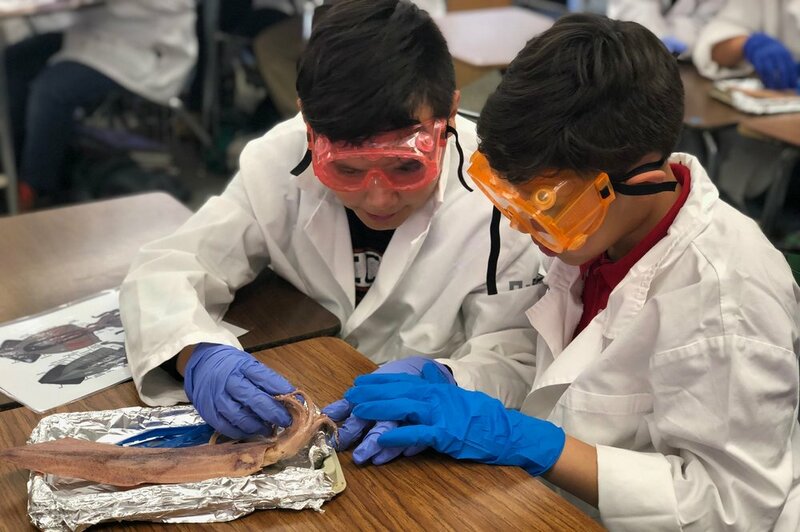 For their Grand Prize experience, the students chose to conduct a dissection experiment with the Arizona Science Center to study the anatomy of a squid. The Local First Arizona Foundation, Arizona Rural Development Council, and Arizona SciTech Festival designed Science Happens Here to advance STEM education in rural Arizona. The program bridges the gap between formal and informal learning environments by expanding on classroom learning with accessible, hands-on, project-based activities while simultaneously providing an avenue for the local businesses community to collaborate with the school system. When kids step into a local bakery, they are often drawn to the sight of the delicious cupcakes and sweet smells that fill the air, but these trading cards encourage them to dive deeper. In placing the “Flour Power” playing card at Romeros Mexican Panaderia (304 North 15th Street, Cottonwood, AZ 86326) we aim to teach kids about the science our local bakers use on a daily basis to make those pastries; such as the function of flour and the reaction of rising yeast.